Multiple New York City departments officially denied any involvement of ghosts in a mysterious ooze leak near the heavily-polluted Gowanus Canal in Brooklyn. A local funeral director declined to comment. 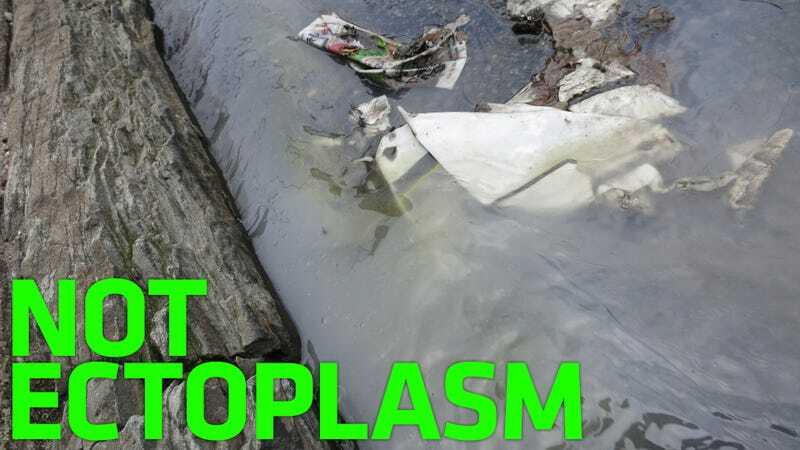 When asked if there were any kinds of ectoplasm present, NYFD Department Chair Kevin Woods stated that the liquid was a non-hazardous substance. "It's mostly water." Despite earlier alarms, he stated that the substance was roughly 1,000 gallons of water from a broken water main mixed with oil used to cool underground electrical lines operated by ConEd. The break occurred sometime around 11 this morning and should be repaired by the end of the afternoon. Woods further stated that there were no ghosts present, nor were there any ghost reports. The Department of Environmental Protection stated they still needed to take a sample of the liquid to make sure it was non-hazardous, as well as check the river. A DEP representative named Billy further stated he was "pretty sure" there were no ghosts involved. When asked if there were any reports of ghosts in the area, the Department of Sanitation stated, "nah." One man hired by ConEd who was in charge of getting trucks to the leak on 23rd street between 3rd and 4th avenues further denied any ghost presence, or any official measure to deal with ghosts. I asked, "if anyone had brought a squad to "bust" the ghosts, you'd have heard about it?" He replied "Oh yeah, for sure." He declined to give a name. Another ConEd worker responded to my request for comment asking, "who exactly do you work for?" Local resident John stated he had, in fact, witnessed a ghost in college when he worked in a theater. "It was a radiator in the theater. Any romantic scene, summer or winter, it would go on. Even when the heat was off." I asked John if he was confident that he was not followed by the ghost. "No, no I'm sure it lives in the theater. It's a theater ghost." A worker at the funeral home on the corner declined to comment on the presence of ghosts at his place of work stating, "I don't have time for this."